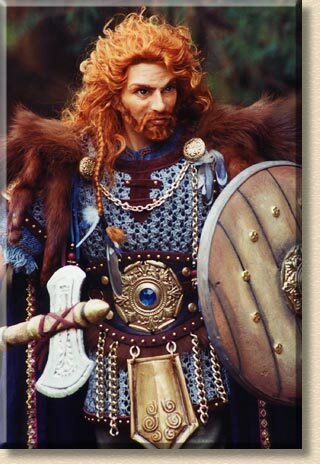 The red-haired hero of Norse mythology heads into battle. Media: Head, arms, and feet of Super Sculpey, on a wire armature, with a cloth body. He has hair and beard of red mohair. He's wearing olive pants, cross-laced with leather up to the knee, and leather shoes. He wears a blue tunic under his chain mail knitted of black crochet cotton and spray-painted silver. He has a wide leather belt with metal medallions, plates, and chains hanging down. He has a long dark cape, and wears an animal skin over his shoulders, with the legs dangling down. Props: He carries a wooden shield, made by Jan Boers, and a battle-axe made from a shaped dowel and layers of cardboard for the blade.